You must be a member of the San Diego Outdoor Activities Group to attend this activity. Would you like to join this group? Experience the gray whale migration from the seat of a kayak! Leaving the waters of the Arctic and heading south to the lagoons of Mexico, gray whales naturally migrate past La Jolla during the winter. This is a non-polluting, non-threatening, and intimate way to experience one of the most majestic mammals on the planet! Your guides will lead the group about two miles out from shore, where you’ll stop at the best spots to view gray whales. 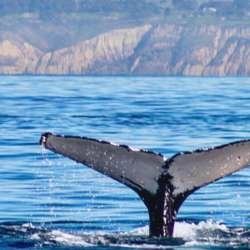 Along the way you’ll learn interesting facts and history about the whales, other marine life, and the La Jolla Ecological Reserve. Keep in mind gray whales are wild animals. Although we typically see a large number of them during the season, we cannot guarantee a sighting, although we often see dolphins, sea lions, harbor seals, and other marine life as well.